The Egyptian Armed Forces are the state military organisation responsible for the defense of Egypt. They consist of the Egyptian Army, Egyptian Navy, Egyptian Air Force and Egyptian Air Defense Command. In addition, Egypt maintains 397,000 paramilitary troops. The Central Security Forces comes under the control of the Ministry of Interior. The Border Guard Forces falls under the control of the Ministry of Defense. The Commander-in-Chief of the Armed Forces, the senior uniformed officer, is Colonel General. Mohamed Zaki (since June 2018), and the Chief of Staff is Lieutenant General. Mohammed Farid Hegazy [ar] (since October 2017). The Armed Forces' inventory includes equipment from different countries around the world. Equipment from the Soviet Union is being progressively replaced by more modern U.S., French, and British equipment, a significant portion of which is built under license in Egypt, such as the M1 Abrams tank. Egypt is a participant in NATO's Mediterranean Dialogue forum. Egypt is one of the few countries in the Middle East, and the only Arab state, with a reconnaissance satellite and has launched another one EgyptSat 1 in 2007. The Armed Forces enjoy considerable power and independence within the Egyptian state. They are also influential in business, engaging in road and housing construction, consumer goods, resort management, and vast tracts of real estate. Much military information is not made publicly available, including budget information, the names of the general officers and the military’s size (which is considered a state secret). According to journalist Joshua Hammer, "as much as 40% of the Egyptian economy" is controlled by the Egyptian armed forces, and other authoritative works such as Springborg reinforce this trend. Senior members of the military can convene for the Supreme Council of the Armed Forces, so during the course of the Egyptian Revolution of 2011, when Mubarak resigned and transferred power to this body on February 11, 2011. In the early 1950s, politics rather than military competence was the main criterion for promotion. The Egyptian commander, Field Marshal Abdel Hakim Amer, was a purely political appointee who owed his position to his close friendship with Nasser. He would prove himself grossly incompetent as a general during the Suez Crisis. Rigid lines between officers and men in the Egyptian Army led to a mutual "mistrust and contempt" between officers and the men who served under them. Tsouras writes that the Israelis "seized and held the ..initiative throughout the campaign and quickly destroyed the Egyptian defenses." In a few instances, such as at the Mitla Pass and Abu Aghelia, Egyptian defenses were well-organised and stubbornly held, but this did not make enough difference overall. Nasser ordered a retreat from the Sinai which allowed the Israelis to wreak havoc and drive on the Canal; on 5 November British and French parachute landings began in the Canal Zone; but by 7 November U.S. pressure had forced an end to the fighting. Before the June 1967 War, the army divided its personnel into four regional commands (Suez, Sinai, Nile Delta, and Nile Valley up to the Sudan). The remainder of Egypt's territory, over 75%, was the sole responsibility of the Frontier Corps. In May 1967, Nasser closed the Straits of Tiran to passage of Israeli ships. Israel considered the closure of the straits deadly serious, and prepared their armed forces to attack. On June 3, three battalions of Egyptian commandos were flown to Amman to take part in operations from Jordan. But U.S. historian Trevor N. Dupuy, writing in 1978, argues from King Hussein of Jordan's memoirs that Nasser did not intend to start an immediate war, but instead was happy with his rhetorical and political accomplishments of the past weeks. Nevertheless, Israel felt they needed to take action. The Egyptian army now comprised two armoured and five infantry divisions, all deployed in the Sinai. In the weeks before Six-Day War began, Egypt made several significant changes to its military organisation. Field Marshal Amer created a new command interposed between the general staff and the Eastern Military District commander, Lieutenant General Salah ad-Din Muhsin. This new Sinai Front Command was placed under General Abdel Mohsin Murtagi, who had returned from Yemen in May 1967. Six of the seven divisions in the Sinai (with the exception of the 20th Infantry 'Palestinian' Division) had their commanders and chiefs of staff replaced. What fragmentary information is available suggests to authors such as Pollack that Amer was trying to improve the competence of the force, replacing political appointees with veterans of the Yemen war. After the war began on 5 June 1967, Israel attacked Egypt, destroyed its air force on the ground, and occupied the Sinai Peninsula. The forward deployed Egyptian forces were shattered in three places by the attacking Israelis. Field Marshal Amer, overwhelmed by events, and ignoring previous plans, ordered a retreat by the Egyptian Army to the Suez Canal. This developed into a rout as the Israelis harried the retreating troops from the ground and from the air. Scholars such as Kenneth Pollack, deAtkine, and Robert Springborg have identified a number of reasons why Arab (and Egyptian) armies performed so poorly against Israel from 1948 to 1991 and afterwards. In battle against Israel from 1948–91, junior officers consistently demonstrated an unwillingness to manoeuvre, ‘innovate, improvise, take initiative, or act independently’. Ground forces units suffered from constant manipulation of information and an inattention to intelligence gathering and objective analysis. Units from the two divisions dispatched to Saudi Arabia in 1990–91, accompanied by U.S. personnel during the 1991 Gulf War, consistently reported fierce battles even though they actually encountered little or no resistance. This occurred whether or not they were accompanied by U.S. military personnel or journalists. Later researchers such as Springborg have confirmed that the tendencies identified in the 1980s and 1990s persist in the Armed Forces in the twenty-first century. The inventory of the Egyptian armed forces includes equipment from the United States, France, Brazil, the United Kingdom, the Soviet Union, and the People's Republic of China. Equipment from the Soviet Union is being progressively replaced by more modern U.S., French, and British equipment, a significant portion of which is built under license in Egypt, such as the M1A1 Abrams tank. Conscripts for the Egyptian Army and other service branches without a university degree serve three years as enlisted soldiers. Conscripts with a General Secondary School Degree serve two years as enlisted personnel. Conscripts with a university degree serve one year as enlisted personnel or three years as a reserve officer. Officers for the army are trained at the Egyptian Military Academy. The Egyptian Air Force (EAF) is the aviation branch of the Egyptian Armed Forces. Currently, the backbone of the EAF is the F-16. The Mirage 2000 is the other modern interceptor used by the EAF. The Egyptian Air Force has 216 F-16s (plus 20 on order). It has about 579 combat aircraft and 149 armed helicopters as it continues to fly extensively upgraded MiG-21s, F-7 Skybolts, F-4 Phantoms, Dassault Mirage Vs, and the C-130 Hercules among other planes. Egypt currently operates 11 Dassault Rafale a French twin-engine fighter aircraft as of July 2017 with another 24 on order. 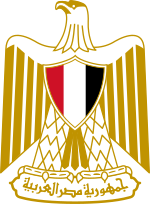 The Egyptian Air Defense Forces or ADF (Quwwat El Diffaa El Gawwi in Arabic) is Egypt's military command responsible for air defense. Egypt patterned its Air Defense Force (ADF) after the Soviet Air Defence Force, which integrated all its air defense capabilities – antiaircraft guns, rocket and missile units, interceptor planes, and radar and warning installations. It appears to comprise five subordinate divisions, 110 surface-to-air missile battalions, and 12 anti-aircraft artillery brigades. Personnel quality may be 'several notches below' that of the Air Force personnel. Its commander is Lieutenant General Abd El Aziz Seif-Eldeen. The Egyptian Navy was established after the Second World War. Some fleet units are stationed in the Red Sea, but the bulk of the force remains in the Mediterranean. Navy headquarters and the main operational and training base are located at Ras el Tin near Alexandria. The current commander is Vice Admiral Ahmed Khaled Hassan Saeed, who relieved Vice Admiral Mohab Mamish. The Chief of Staff of the Navy is Rear Admiral Mohamed Abdel Aziz El Sayed. The Navy also controls the Egyptian Coast Guard. The Coast Guard is responsible for the onshore protection of public installations near the coast and the patrol of coastal waters to prevent smuggling. it has an inventory consisting of about thirty five large patrol craft (each between twenty and thirty meters in length) and twenty smaller Bertram-class coastal patrol craft built in the United States. See list of naval ships of Egypt for a list of vessels in service. The U.S. provides annual military assistance to the Egyptian Armed Forces. In 2009, the U.S. provided nominal $1.3 billion to the Egyptian military ($1.52 billion in 2019). This level is second only to Israel. ^ IISS 2019, pp. 336–339. ^ a b c d IISS 2019, p. 336. ^ Staff, By the CNN Wire. "Egypt's military: Key facts". Retrieved 2017-04-12. ^ "Minister of Defense". www.mod.gov.eg. ^ "Chief of Staff". www.mod.gov.eg. ^ "Egypt to launch first spy satelllite". The Jerusalem Post. Retrieved 2009-03-31. ^ a b c Cambanis, Thanassis (11 September 2010). "Succession Gives Army a Stiff Test in Egypt". The New York Times. Retrieved 11 September 2010. ^ Murdock, Heather (February 11, 2011). "Crowds rejoice as Egypt's Mubarak steps down, hands power to military". The Washington Times. Retrieved February 11, 2011. ^ Varble, Derek (2003) 'Essential Histories: The Suez Crisis 1956' p. 17. ^ Varble, Derek (2003) p. 18. ^ a b Tsouras, 1994, 127. ^ a b Dupuy, Trevor N. (1978). Elusive Victory: The Arab-Israeli Wars, 1947–1974. London: MacDonald and Jane's. p. 228. ISBN 0-356-08090-0. ^ T.N. Dupuy, 1978, 229–230, citing Hussein, My "War" with Israel, 1969. ^ Tsouras, 'Changing Orders,' Facts on File, 1994, 191. Dupuy (1978) lists the 2nd, 3rd, 7th Infantry Division, 6th Mechanised, 20th Palestinian, and 4th Armoured, plus an armoured task force. Dupuy, 239–240. ^ a b Pollack, 2002, 60. ^ Pollack, Arabs at War: Military Effectiveness, 1948–1991, University of Nebraska Press, 2002, ISBN 0-8032-3733-2, 146. ^ Springborg, Robert. "Learning from failure: Egypt." The Routledge Handbook of Civil-Military Relations. London: Routledge (2013): 93–109. ^ "Military Database - Scramble". www.scramble.nl. Retrieved 2019-03-05. ^ Touchard, Laurent (2017). Forces Armees Africaines 2016–2017. Paris: Laurent Touchard. p. 58. ISBN 9781545499801. ^ "Scenesetter: President Mubarak's visit to Washington". US Department of State. 2009-05-19. Archived from the original on 2011-01-27. ^ David Costello (February 1, 2011). "Nation locked in a deadly stalemate". The Courier-Mail. Retrieved 2011-02-11. Norvell deAtkine, 'Why Arabs Lose Wars,' Middle East Quarterly, 6(4). CMI Publications, "The Egyptian military in politics and the economy: Recent history and current transition status". www.cmi.no. Retrieved 2016-01-21. H.Frisch, Guns and butter in the Egyptian Army, p. 6. Middle East Review of International Affairs, Vol. 5, No. 2 (Summer 2001). Hazem Kandil, Soldiers, spies, and statesmen: Egypt's road to revolt. Verso Books, 2012. "The Egyptian Armed Forces and the Remaking of an Economic Empire". Carnegie Middle East Center. Retrieved 2016-01-21.